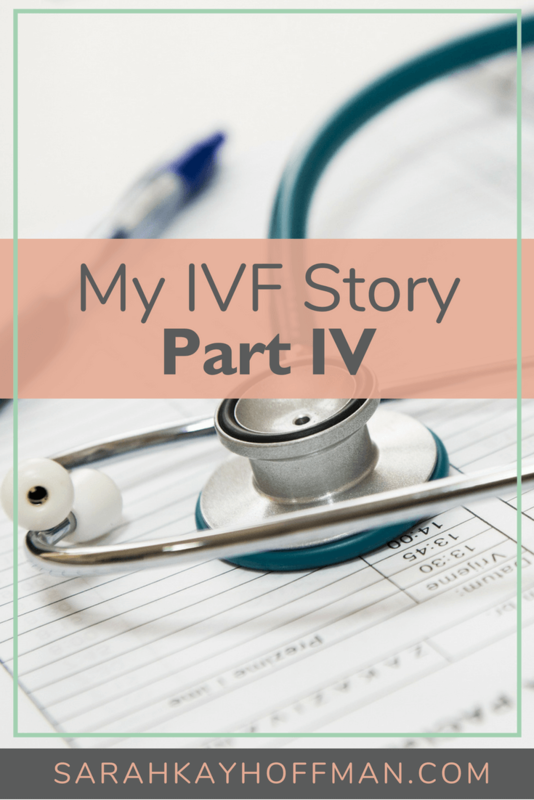 Today is my IVF story Part IV. Click HERE for Part I. Click HERE for Part II. Click HERE for Part III. That following week, the suspicions I had immediately post-cat scan became reality. The blood tests result proved that I was not pregnant. I already knew, though, as I had started the nasty (never-a-friend) Aunt Flo. When she came it was not only physically very painful but also extremely emotionally painfully. I cried. And cried. Then I cried some more. I went over different scenarios in my head for the longest time. I played the, “what if I had done xyz or abc or jkl” game. On Sundays during church, I would see children and babies and I had to swallow so hard to hold back the tears. For a long time I held it in, but I “blamed” Sutter Hospital for doing the cat scan (and yes, I even wrote a letter to them, detailing everything -> of course, I never heard from them) and to be 100% honest, I also blamed my IVF doctor. I mean, how could she not have known the risk of 8 cysts bursting? I blamed and blamed because I was so frustrated that all the pieces were there, yet somehow they all crumbled. We didn’t only lose over $10K, but we also lost a ton of hope….at least in those early days. Close friends and family ask if we’ll go through an IVF cycle again. We have no plans to, but that’s not to say we won’t. It’s not in our cards at this moment, and while we appreciate all the stories of “IVF worked for us, it can work for you,” I’m going to go out a limb here and just say it….well that’s nice for you. Infertility has affected me in ways that I never knew would be possible. Friends get pregnant thinking about a baby, and I wonder why not us? Friends go to “mommy groups,” and I wait patiently to be a part of those circles. People ask, “When are you and Ryan having kids?” I joke it off, but cry inside. I’ll find myself judging when I know it’s wrong. I hear a child say “mommy,” and dream about being called that as well. And if you want the honest, real and raw truth, the way in which infertility has affected me the most is knowing that there is the chance that there may never be a human that is half of me and half of the best person I have ever known in my whole life, Ryan. When you struggle with any part of infertility, you will, without a doubt, find yourself struggling many days with it. These struggles, like any and all struggles, have made me strong. Really strong. We all have these struggles. Yes, you too. Everyone struggles, but not everyone finds the purpose in those struggles. I always find purpose in the struggle. Ryan and I have plans, but more importantly than that, we have each other. I thank God daily for this because I know that infertility and the IVF process, more often than not, creates a blame game, fighting and an unpleasant household. This was never, not for one second, how our lives went on. Hope never leaves us; we only leave hope. I left it for a long time. I cling to hope today because I can, because I believe and because it’s the one thing that always reminds me that the best part of my (our) “infertility story” is yet to come. Beautifully written. Your honestly is inspiring! Thank you for sharing your story. I have been following your story for a while. You are so incredibly strong. I admire how you handle yourself and I wish you and Ryan all the luck and love in the world. You will both be fantastic parents someday, I just know it. I admire your honesty and vulnerability. 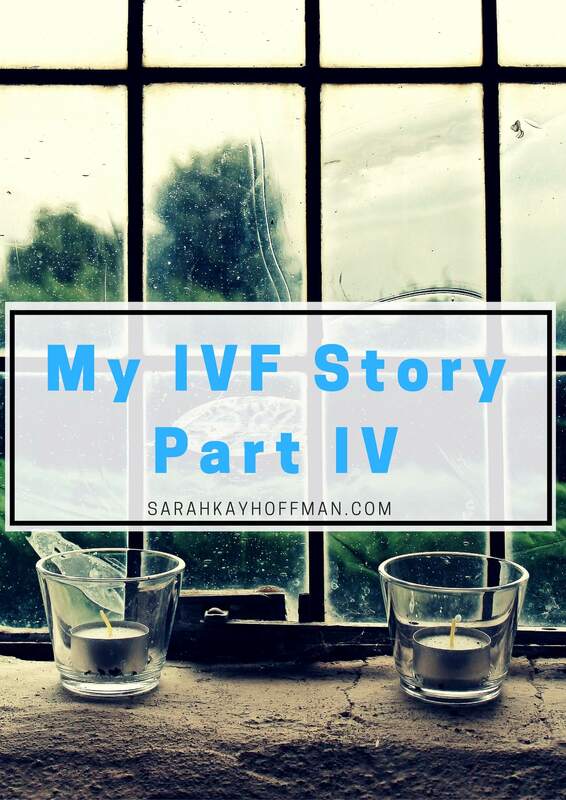 Your IVF story is very heartbreaking for me to read and I have so many friends who are healthy enough but with infertility issues. It’s ironic how all 4 aunts of mine were blessed with at least 3-7 kids each while 1 aunt can’t even have one. I really appreciate it, Dorothy. There is nothing I can say that I feel could take away the hurt. But what truly stands out to me is your composure. Your hope. Your positivity. I am so happy you and Ryan have each other. I love your faith. I pray you will be a mother some day, you would make an extraordinary one. I just hope you know I’m thinking of you and I believe you’re an amazing person. I admire the hope you continue to hold onto. Don’t forget how many people are blessed to know you. This was an amazing story, thank you for sharing it with us. I wish I had the perfect words. The ones that would help or soothe…but of course I don’t. HUGS. I will continue to pray for you guys. I read your story & feel both your pain and your strength. Thank you for sharing so much of yourself with us. Thank you for sharing your story. This is the first post I’ve read of yours but I’m anxious to go back and read the others. I loved what you said about the daily struggles for someone going through infertility. Believe me, I know them all too well and am living through them again right now. I’m so hopeful that when the time is right, you will be blessed with a child. I know the waiting and struggle is hard and frustratig but know that people that don’t even know you (like me!) are thinking about you and praying for you. Thanks for opening up and for your honesty. I have been following your story as you began with infertility awareness week and this post leaves me with tears welling up. Tears for your pain and sadness and also tears of hope and strength that you have because you are a Believer. I trust that His promise in Ecclesiastes 3 continues to lift up both you and your husband. You are His and He cares for you and your desires. I love this so much, Jenny! All my love. You are an amazing young woman. Your transparency is beautiful. God has given you a wonderful gift to open your heart the way you do. You and Ryan are in my prayers dear one. Thank you for sharing. We face over 2 yrs of infertility and start stim meds in a few weeks. I’m terrified but find hope in your story. I too will remain hopeful and cling to God to walk with me through this, even carry me when necessary. Good luck to you, Amy! I will be thinking of you, and praying. Take it one day at a time with the process. I hope your bean(s) stick. If anyone understands that kind of pain, I do.. I had nine miscarriages. I wasn’t even a candidate for IVF because apparantly my immune system works SO well, that it fights everything off! I was in a study at the University of Chicago for Most of 2007. I travelled there once a month. After sending 14 vials of my blood and 8 from my husband to a Dr. in Calivornia, We had to go to Mexico twice and pay cash for a procedure that is done here to prevent organ rejection but not to prevent embryo rejection. I am still, today, paying off the over 10k in expenses I racked up. I know this sounds weird, but just stop trying for a while. Love your life, love your husband, and just be happy. It is surprising what it can bring. Good luck, I hope things happen for you. Praying for you, Cheryl. What an incredible story. Have you gotten pregnant yet? I so feel your aching pain. I knew that our IVF cycle didn’t work before I got the call. It’s so not fair. We never blamed each other either. It kills me that my husband and I can’t have a baby, but I haven’t given up hope. Hi, I hopped over here after your comment on my blog. I’m so sorry you and your husband are going through this. I completely relate to the fear of never having a little half me half my husband human. Thank you for sharing your story. I really believe more women should be open about their struggles. Reach out whenever…I hope you have success! Wow Sarah! I’m so sorry to read about your struggles with getting pregnant. Aaron and I were planning on trying late this summer and we hardly think of any issues. It’s insane to think that we try for so long to ‘not’ get pregnant that when the time comes you just don’t imagine any problems. I wish we wet closer to each other like in high school 🙂 so I could give you a big hug and a little buzzzz from your friendly ‘Bee’. Miss you and we wish you and Ryan the bet of luck with your future decisions….no matter what happens you’ll have your best friend ‘Ryan’ right there with you! He is faithful. This I have never forgotten. Thank you, Rebekah! Your story touches my heart so much. It is so close to my own. My husband and I went through IVF only to have one embryo and I did not become pregnant. We are very excited to be parents through adoption, but my heart breaks a little every day knowing that there won’t be a person made by me and my most favorite guy in the whole world. Thanks for sharing your story. I’ve never been able to be so open. I am a Crohnie and blogger and I just came across your blog and saw “infertility” and absolutely inhaled every word because of my current childlessness and fear about Crohn’s somehow effecting fertility. I really appreciate you sharing your story – vulnerability is blogging is something I treasure and am trying to do more of. I’ll be reading more and more i the days to come and can’t want to touch base with you. Hi Megan! Thank you for stopping by…I’m so glad you found a place where you can say, “me too.” Take care!